Questioning yourself before starting anything is the technique that many of us used to follow while you are starting something new. Yes! It is very important to question yourself while you are catching up with a new project which can help you to get prepared and get ready to face the things in a pre-planned way. So, while you are starting a new youtube channel, you must go with some questions about why you want to start and what you are expecting and every other thing about what, why, and how. So, here are some 15 questions to ask you before starting a new Youtube channel. Here we go..
1. Why do you want to start a Youtube channel? 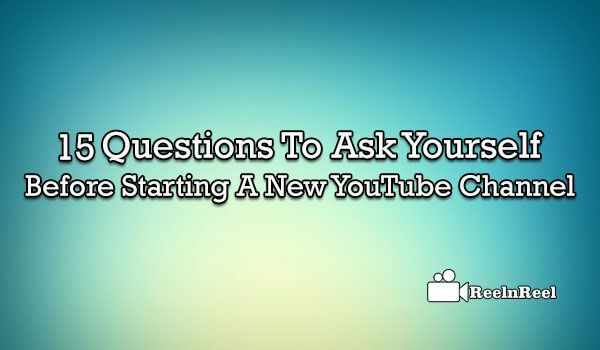 It must be the first questions that must ask yourself while you are starting a youtube channel. If your answer is only for the money making, and then you must rethink once. Because it requires good effort and lot of time to get successful on youtube. You must have a passion towards what you are doing. 2. What type of videos you want to make? Once you have decided why do you want to start then the next question is what type of content you want to make on Youtube platform. So, know your industry, your interests and your reasons to start and make the best plan to deliver the same with your videos. 3. Is this a niche that you are really interested in? Question yourself about the niche you are following and ask yourself whether it is the one you want heartfully or you are making something because it is having best demand. So, question yourself and go with your heart. 4. How often do you plan your uploads? Ask yourself about this as it is very important because consistency plays a great role. So, plan your uploads at a specific time on a specific day in a specific week and continue the same. 5. How are you going to make your videos? Ask yourself about how you provide yourself with the type of camera, lighting, and other requirements. 6. What audience are you targeting? Ask yourself about how you can reach your targeted audience. 7. Are other Youtubers are serving the audience? Do research and conclude the answer to this question which can provide the toy with the best way to go with. 8. How are you going to make your videos? Plan about the different formats and the type of the video content to have a better vision for your future uploads. 9. How much time you want to spend for your video efforts? To get successful with the Youtube channel one must spend the time to build, interact ad implement. 10. How patient are you? You require a lot of patience and efforts to reach the things. 11. How are you going to measure? To determine the channel status, you must have definitive goals to measure the things. 12. Do you know about strategy? A perfect strategic plan is very important to get succeed. So, question yourself what type of strategic plan you want to implement in order to get successful. 13. Do you know social media cross promotion? Cross promotion is important to gain good exposure. So, know how to promote your video channel. 14. How to approach and apply SEO? SEO is very important for ranking. Know more and build a strategy. 15. How to collaborate, advertise and promote your Youtube channel? Know about different YouTubers in your niche. Connect with them and plan how to approach the things and implementation. everyone think off how to start YouTube Channel , there are various doubts in their minds. The above questions will solve your problem of How to start YouTube.